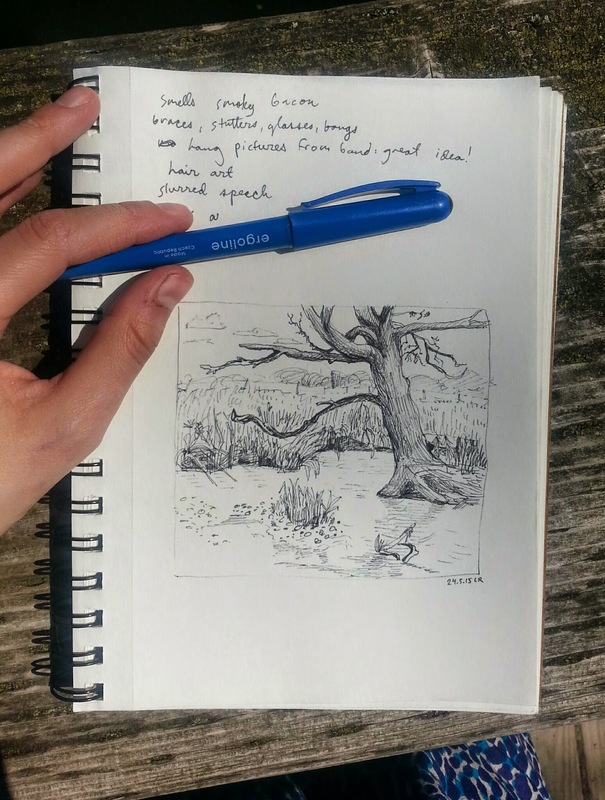 Yesterday I posted some tips for sketching on the fly (scroll down to see those). Today my Travel Writing class went on a field trip to a place called Kline Creek Farms. It is a beautiful farm which has been preserved in true 1890's style. There is a house, an old smithy and sheep. It reminded me of Almanzo Wilder's home from Farmer Boy. I knew I had to do some drawing and as I was sketching I thought of several more tips for becoming a prolific sketcher. 1. Always Carry Your Sketchbook: This seems obvious and I apologise it it seems rather simplistic. But the truth is some people don't carry their tools around! Some of the girls from the Travel Writing class asked our professor at the beginning of our field trip if they should take their notebooks or not. 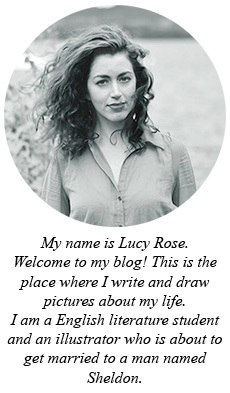 I rolled my eyes (inwardly). What a ridiculous question! The professor thought it was pretty silly as well, although he was more gracious. I carry my sketchbook everywhere - the library, the restaurant, the mall, Target etc. 2. Beware of Laziness: Today I knew that I technically wanted to sketch at the farm, but when we actually got there I just felt lazy. I didn't want to take the time to sit down in one spot and record what I was seeing. I felt tired and warm from the sun. I took a couple of half hearted sketches of the smithy, but when they turned out poorly I felt like giving up and wandering around like everyone else. I finally made a compromise. I took photos of some of the things that I thought looked like good drawings and then I wandered away from the group and found a great creek bank. After I was in the quiet I could focus and do a sketch that I actually liked. 3. Develop a Shorthand: This is a tip which I have discovered after years of trial and error drawing nature. Nature can seem very daunting to draw. This was me: "All those leaves! How do I draw every single one?! AHHHH!!! How do I draw all he blades of grass?!" I have discovered that the key is finding shortcuts. Experiment with finding some easy marking patterns which can stand in for certain types of nature. Clumps of "U"s can be leaves. Patches of "I"s can be grass. Stippling can be tiny flowers. Little circles can be pebbles. 4. Don't Draw Every Branch of the Tree: This one sort of echoes the above tip. 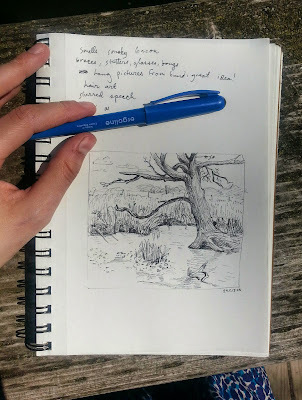 Sometimes you can get daunted when you draw from life, especially in nature. We think that we have to be ultra true-to-life. This is not a bad thing, but you can definitely take it overboard. When drawing trees, for instance, focus on the trunk and some main branches, but don't burden yourself with thinking that you have to draw every curve of every branch. Sketch the general idea of the tree and go back and adjust it. I hope these have been helpful, Guys! I hope they don't sound too condescending. May they instead compel you to sketch.